Phonographic Copyright (p) – Personal Records, Inc. Copyright (c) – Personal Records, Inc.
Comes with the yellow/green die-cut sleeve. Produced, arranged, mixed and edited for D&B Productions. Recorded and mixed at Gnome Sound, Detroit, Mich. Published by Personal Music / Beezer Music, ASCAP. 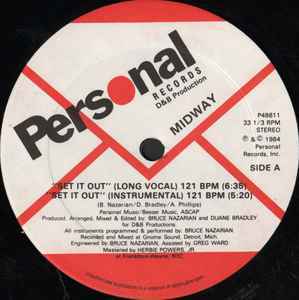 ℗ & © 1984 Personal Records, Inc.